Whatever your age, Fun Fore All Family Fun Park is your place for FUN! We are home to the area's best family-friendly rides, games, and attractions! FUN FORE ALL'S XD DARK RIDE Our newest and most exciting attraction the XD Dark Ride is a fun experience for the whole family. Experience this thrilling adventure as you are riding, running, flying, and falling through different worlds. This 4D experience is also a game as you use your blaster to score points and try to get the highest score. $7 PER PERSON PER RIDE Riders must be at least 40″ tall. Purchase a Time Play Pass for unlimited access to the XD Dark Ride! 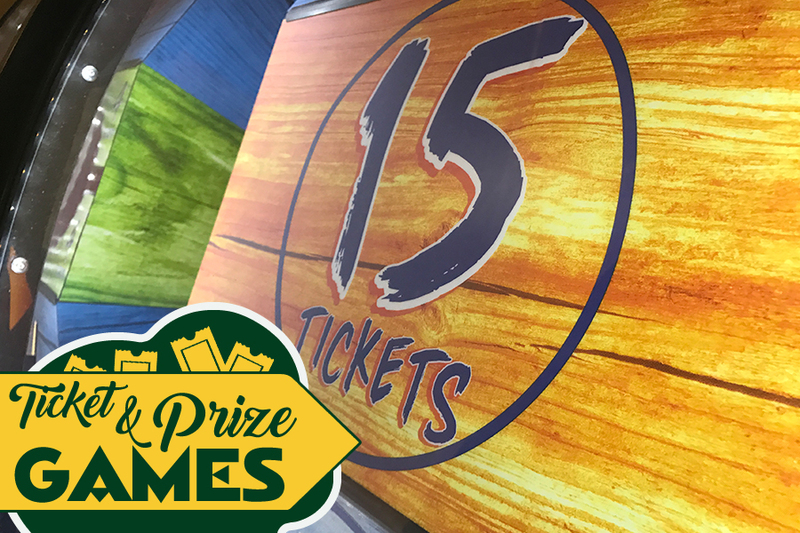 Earn tickets when you play the more than 40 Ticket Games in our arcade. The tickets you earn are automatically added to your Fun Card. Redeem your tickets for awesome toys and prizes! We have 100s of prizes to choose from, and we update The Prize Store every week! Sample Prizes: Stuffed Animals, Electronics, Toys, Drones, Video Game Systems, Board Games, Novelties, Candy, Sports Equipment, and so much more! FIESTA EXPRESS (KIDDIE COASTER) This thrilling ride is a kiddie-sized roller coaster. The Kiddie Coaster zig zags around tight bends for excitement for all ages. Children under 36″ tall must ride with an adult. HAPPY SWING Get ready for some high flying fun when you ride the Happy Swing. This is no ordinary swing as you swing back and forth and higher and higher each time. Children under 36” tall must ride with an adult. JUMP AROUND Hang on as you go around in mini Jeeps but be ready for the bouncy ride. Children under 36″ must ride the Jump Around with an adult. BALLOON RIDE Our biggest Kiddie Ride! Feel like you are riding in your own hot air balloon as you go around and around and up and down! Children under 36″ must ride the Balloon Ride with an adult. $2 PER PERSON PER RIDE Riders must be at least 36” tall to ride by themselves. If under 36” tall, you must ride with an adult at least 58” tall. • Unattended riders must be a minimum of 36” tall. • Under 36” tall must be accompanied by an adult and must be able to stand/walk on their own. • No running or horseplay on or around ride areas. • Each rider must wait for an attendant to assist them on and off the ride. • No food or drinks are permitted on rides at any time. This ride will not operate during rain or high winds. All rides meet all state safety requirements and are inspected daily. Race our fast karts around the looping track that includes a bridge and an underpass! We have double seater karts for riders that are not tall enough to drive yet but still want in on the fun. $6 PER PERSON PER RIDE $2 PER PASSENGER PER RIDE All drivers must be at least 58” tall, and passengers must be at least 36” tall. • Drivers must be at least 58” tall. • Passengers must be at least 36” tall. • Proper shoes and clothing must be worn. • Keep hands and feet inside the kart at all times. • No eating, drinking or smoking allowed in the track area. • Stay seated and face forward in your kart until directed by the attendant. • No bumping or swerving while driving on the track. • Beware of karts in front of, beside and behind you at all times.Anyone assumed to be under the influence of alcohol or drugs will not be permitted in the track area. • Due to the nature of this attraction, it is not recommended for individuals who have heart problems, neck or back problems, or if you are pregnant. • These go-karts have rotating parts. Hair longer than shoulder length must be secured above the shoulder. • You are riding at your own risk. • Any misconduct or breaking the rules will result in dismissal from the track area without a refund. With over 40 ticket games to choose from, you won’t want to leave our arcade. These skill-based games award you for how well you play. Use your stellar skills to conquer games like Deal or No Deal, Tower of Tickets and Fish Bowl Frenzy. Ticket games in the arcade are sure to impress every age! With over 25 video games to choose from, you won’t want to leave our arcade. Whether it’s classic games like Ms. Pacman, Galaga, or Ghostbusters pinball or newer games like Star Wars Battle Pod, Big Buck HD Wild, Fast & Furious Super Cars and Jurassic Park, you won’t be disappointed. With our video arcade games you’re simply playing for the joy of the game. No tickets or prizes are awarded. A wet and wild favorite, our electric bumper boats come fully equipped with water guns. Bring your friends and bring a towel, because you might get wet. The boats are lots of fun, especially during the warm days of summer. Bumper Boats will open for the season Friday, May 10th. $6 PER PERSON PER RIDE $2 PER PASSENGER PER RIDE All drivers must be at least 44” tall, and passengers must be at least 36” tall. • Drivers must be at least 44” tall. • Due to the nature of this attraction, it is not recommended for individuals who have heart problems, neck or back problems or are pregnant. • Stay seated at all times during the ride. • Keep hands and feet inside the boat at all times. • No swimming or diving is permitted (pool is 36” deep) • Keep loose clothing away from motor. • No running or horseplay is permitted. • Wait for attendant to assist you in and out of the boat. • Fun Fore All is not responsible for lost, damaged or missing items during the ride. • Maximum of one adult and two children per boat (275lbs. maximum weight per boat). • The adult must sit in the center and control the motor during the ride. • Raise your hand if you need assistance during the ride. • The rider assumes all risks of harm or injury that may occur when riding or operating this ride. 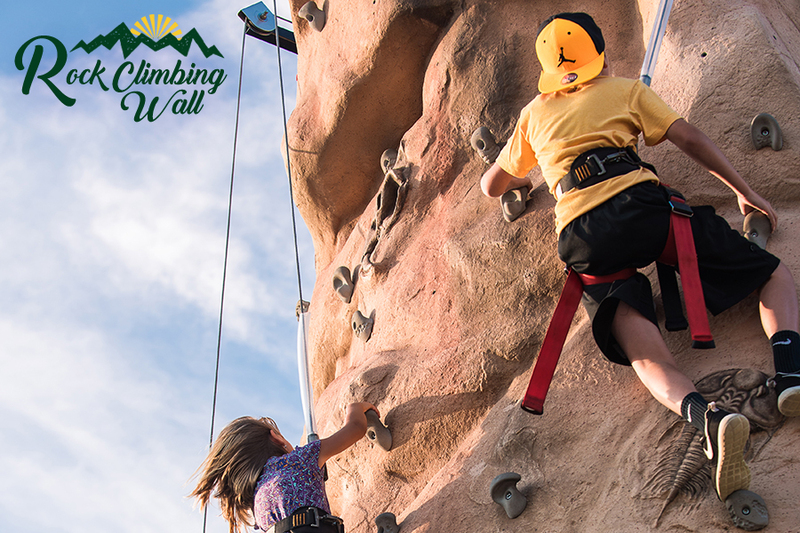 See if you can make it to the top of this 26′ foot tall rock! We hook you into our auto-belay harness so you feel just like a real rock climber, then you get to try and make it to the top. Race your friends or just challenge yourself to make it all the way to the top. $3 PER PERSON Minimum weight requirement 45lbs. Maximum weight 250lbs. • Must weigh 45lbs minimum, 250lbs maximum to wear climbing harness. • Climber must fit in the harness to be allowed to climb. • After you are hooked into your harness, stay in the harness area. • Wait until the operator instructs you to go to the climbing area. • Do not step on the auto belay cable while you wait to start. • Stay on the climbing route for your station. • Do not cross over to put yourself directly beneath or above other climbers. • Do not climb without shoes or shirt. • Do not climb beyond the wall top. • Do not kick off more than 4 to 6 feet from the wall. • Rappel straight down and do not swing too close to the other climbers. • Be alert for other climbers beneath you who may have strayed from their routes. • When you are lowered to the ground at the end of the climb, land on your feet. • After your climb is complete, wait for the operator to unhook you. Once you have been unhooked, go to the harness area where the operator will remove your harness. Please do not try to remove the harness yourself. Need some hitting practice? Whether you’re a Little Leaguer or playing on an adult team, stop by Fun Fore All and spend some time hitting balls (softball and baseball). We have 9 cages with a variety of pitching speeds (slow, medium, and fast) to fit your style. All machines are well maintained. $2 PER EIGHTEEN (18) PITCHES Pricing is for baseball and/or softball. Rentals are $16 for thirty (30) minutes or $25 for one (1) hour. • Batters must wear helmets at all times. • Only one person in the cage at a time. • Do not cross the red painted line or enter the pitching machine area at any time. • If machines are pitching outside the strike zone, notify a Fun Fore • All attendant immediately and do not use that cage. • These pitching machines throw balls and strikes. Batters must be alert at all times. • Not practice swings outside the cages. • Watch for baseballs and softballs rolling under your feet. It’s four stories of fun for the whole family! Each level has something different that adds up to over thirty (30) interactive things to enjoy. Some of the features of Ballocity: • Air cannons shoot foam balls! • “Ballcano” – Blast foam balls into the air! • A four story slide!!! There is something for all ages to enjoy, even parents!! Ballocity is big enough for adults to get in on the fun, too. There is also a separate toddler area for the little ones. $5 FOR ALL DAY ADMISSION No charge for adults with paid child’s admission. • Children must be monitored by an adult at all times. This is an unsupervised attraction. • Place shoes and loose articles in the shoe saver. Fun Fore All is not responsible for lost, stolen or damaged items. • Be courteous to all customers in Ballocity. • Kids over 44” tall are not permitted in the Toddler Area. • Do not climb on the outside of the play area. • Food, drinks, gum or toys are not permitted in Ballocity. • Be sure to wash your hands after playing and before eating. • Fun Fore All has the right to refuse admission into Ballocity for any customer. • Fun Fore All has the right to remove customers from Ballocity as it deems necessary. Our flagship attraction, we offer two beautifully landscaped miniature golf courses that have a number of scenic waterfalls. The holes are challenging yet easy enough for younger players. If you get a hole-in-one on the 18th hole you get a prize! $7 PER PERSON PER ROUND (Ages 13 & older) $5 PER PERSON PER ROUND (Ages 5-12) Children 4 yrs. old and younger are free with a paid adult. • Limit your group to no more than four players. • No full swings. Putting strokes only. • Do not start play until players ahead have finished the hole. • Be courteous and allow faster players to play though. • Do not climb on rocks or props. • Be alert. Obstacles are a part of the course, watch your step. • Do not lean on or hit light fixtures. • Do not enter water features at any time for any reason. If you need assistance ask a Fun Fore All staff member. • Under 36” tall must be accompanied by an adult and must be able tostand/walk on their own. • No swimming or diving is permitted (pool is 36” deep). • Keep loose clothing away from motor. 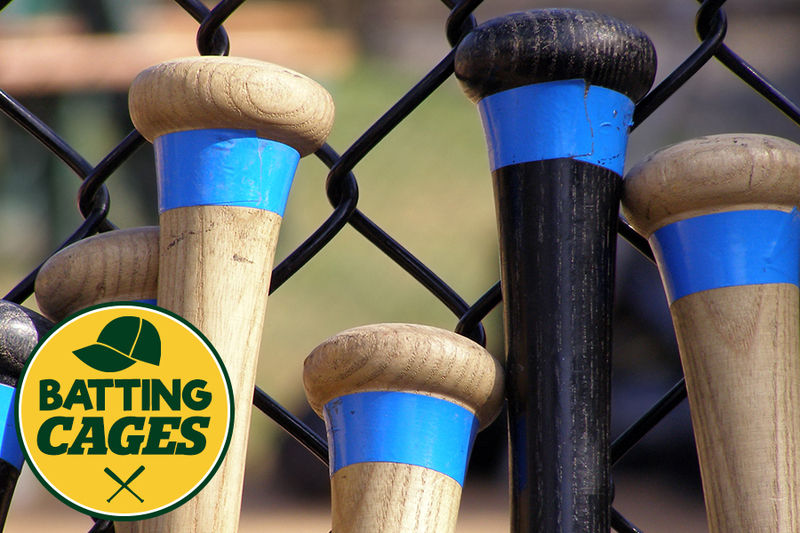 Batting Cages will close for the season on Monday, November 12th @ 10:00pm. The following rules apply to different rides, attractions and devices throughout the park. We ask that you follow these rules for each in order to ensure a fun and safe experience during your visit. If you choose to disregard any or all of the following rules you will be asked to leave the park without a refund. Fun Fore All has the right to refuse admission to rides, attractions and devices for any reason. If you have questions concerning any of the following rules you can email us at info@funforeall.com for more information. Requires that riders must obey all warnings and directions regarding each ride and must behave in a manner that will not cause or contribute to injury to themselves or others. Failure to comply is cause for dismissal from the park without refund. For further information about Pennsylvania act no. 1994-58 contact your state representative or senator. There are inherent risks in the participation in or on any amusement ride, device, or attraction. Patrons of an amusement ride, device, or attraction, by participation, accept the risks inherent in such participation of which the ordinary prudent person is or should be aware. Patrons have a duty to exercise good judgement and act in a responsible manner while using the amusement ride, device, or attractions and to obey all oral or written warnings, or both, prior to or during participation, or both. Patrons have a duty to not participate in or on an amusement ride, device, or attractions when under the influence of drugs or alcohol. Wanting to know more about Fun Fore All Family Fun Park? You have come to the right place! Below you will find some of our most commonly asked questions, if you have any questions that aren't answered below, please feel free to e-mail us at info@funforeall.com. IS THERE AN ADMISSION FEE? There is no admission fee to enter the park itself. You just pay for what you want to do while you are here. HOW DOES A FUN CARD WORK? The Fun Card system is a debit card system that we use to control our entire park. You can add value to your card and use it at the games, rides, and attractions, even food. We offer lots of different specials and deals that you can find on our Specials Page! Purchase a Fun Card from one of our on site kiosks, at our front counter, or online. Once purchased simply insert the card into one of our game readers to start they game. One of our attendants will assist you at our attractions. If you play in our arcade your “tickets” that you would win from games are electronically added onto your Fun Card. Be sure to register your Fun Card at one of our kiosks or with one of our staff. This will get you automatically into our loyalty program and ensures the safety of your Fun Card should something happen to it. Bonus cash, received when certain specials and coupons are used, cannot be used towards the purchase of food and beverages, or other specials, discounts, or coupons. HOW CAN I CHECK THE BALANCE ON MY FUN CARD? You can check your balance at any one of our kiosks, by asking one of our staff. You can also check your balance and add more value onto your Fun Card online HERE. CAN FUN CARDS BE COMBINED AND/OR SPLIT UP? Absolutely, if you have multiple cards, bring them into the front desk and one of our staff would be glad to combine any value for you, even cards with small amounts add up! And if you have one card and would like us to split the value up onto multiple cards, we can do that as well! WILL THE MONEY OR THE TICKETS ON MY FUN CARD EVER EXPIRE? No. The value and tickets on your Fun Card will not expire. Time play on your Fun Card expires at the end of your allotted time. Certain promotional items added to your Fun Card may have expiration dates. You may ask one of our staff for details. HOW DO I REGISTER MY FUN CARD? You can register your Fun Card at any one of our kiosks or by asking one of our staff. Once your card is registered you are automatically signed up for Rewards Program and if your Fun Card is lost or stolen we can replace it for you. CAN I PAY TO MAKE UP THE DIFFERENCE IN TICKETS I NEED TO EARN SOMETHING IN THE PRIZE STORE? Due to licensing restrictions Fun Fore All is unable to sell any merchandise from our Prize Store. All items must be redeemed with tickets won while playing games in the Arcade. Items in Fun Fore All’s Prize Store contain small parts that are not recommended for children three-years-old or younger. HOW DOES THE WEATHER AFFECT THE OUTSIDE ATTRACTIONS? For safety reasons, it is necessary to close our outside attractions during inclement weather such as rain, lightning, extreme temperatures, etc. Our staff will alert our guests when it is necessary to close attractions and possible times for reopening. You may save your Fun Card with value on it and use it towards games, rides, or attractions that are still operating, or bring your Fun Card back on another day. If you have purchased a time card, you may exchange it for a Fun Card of equal value, or a refund valued at the appropriate amount in accordance with the time already used by the guest. ARE OUTSIDE FOOD AND DRINKS PERMITTED? We do not allow any outside food or beverage. The only exception to this policy we make is for a Birthday Cake or cake substitute (i.e. Cupcakes, cookie cake, etc.) If food based allergies or medical restrictions require a patron to eat on a special diet, that patron may bring in their own food item. If you are unsure, or have questions, please speak with one of our Managers! WHAT ABOUT FOOD ALLERGIES? We do our best to accommodate special dietary needs however, Fun Fore All food items may contain certain allergens such as wheat, nut, dairy, etc. Please ask one of our operations manager for details on our food items. DOES FUN FORE ALL USE ANYTHING THAT CONTAINS PEANUTS OR OTHER FOOD ALLERGY BASED INGREDIENTS? Fun Fore All keeps an all-inclusive ingredient list on hand should you ever need to check the ingredients in an item we use. We do not cook with anything that contains peanuts. We do recommend anyone with a peanut allergy refrain from eating our hand dipped ice cream; there is always risk of contamination because some of our flavors may include peanuts. CAN I HAVE MY OWN "WALK IN" PARTY, AND ARE THERE ANY RESTRICTIONS? We welcome all guests. Should you prefer to have your own walk in style birthday, you are welcome to do so, but please keep in mind that seating is very limited during our busy hours, and on weekends. All seating is first come first serve and we cannot reserve an area for you unless you have a booked event with us. Please do not attempt to move or rearrange any tables, chairs, games, or equipment on your own. No outside food or beverages other than a Birthday Cake are permitted on the premises. If for any reason you are planning on bringing a large number of guests to Fun Fore All, and have not made any type of arrangements, please call and speak with a Manager to ensure we are able to meet your needs or email us at info@funforeallcom. IS THERE ANY SORT OF AN ALL DAY PASS? We do not offer an all day pass, however, we offer hourly passes that give you unlimited use of the majority of attractions in the park. Check out our Coupons & Specials page for details. DO YOU OFFER ANYTHING FOR LARGER GROUPS WHO PLAN TO VISIT THE PARK? We have a variety of different options for groups. Check out our Group Rates page for details or email us at sales@funforeall.com. ARE THERE ANY SPECIAL HEIGHT OR WEIGHT RESTRICTIONS FOR THE ATTRACTIONS? All of our rides and attractions have their own individual restrictions. Height and weight restrictions are mandated by the State of Pennsylvania. See our Safety Rules for details on all of our attractions. HOW DO I BOOK MY BIRTHDAY PARTY? You can book your party online by going to our Party Planner page. All the details are available on our Birthday Packages page. DOES FUN FORE ALL GIVE DONATIONS TO LOCAL FUNDRAISING ACTIVITIES? Yes we do. We do require that a formal donation request letter be sent in advance, outlining the event, date, time, location, organization, and a contact name, address, and phone number. Once submitted donations take approximately one to two weeks to be completed and if approved, will be mailed to the address listed on the letter. For more information or with questions please email us at info@funforeall.com. DOES FUN FORE ALL HAVE A LOST AND FOUND? Yes we do. If you think you may have lost an item during a visit to Fun Fore All, please call or stop in and we can check for you! Items found at Fun Fore All are held for 30 days, if they are not claimed within that time, they will be donated to Goodwill. WHAT METHODS OF PAYMENT ARE ACCEPTED? We accept all major credit cards and cash. Only corporate checks are accepted for group payments. HOW CAN I FIND FUN FORE ALL? Fun Fore All is located at 8 Progress Ave. Cranberry Twp, Pa 16066. Our park sits along Route 19, and we are directly across the street from Dairy Queen. For directions, please see the Contact Us or Directions page. WHAT ARE FUN FORE ALL'S HOURS AND HOLIDAYS? Fun Fore All is open year round, including most major holidays. We will be closed on Thanksgiving Day and Christmas Day each year. Hours are subject to change in response to severe changes in weather or business. IS THE PARK REALLY "FUN FORE ALL?" Absolutely! Our park features games, rides, and attractions for children and adults of all ages!